Primitive Winter Snowman Vintage Bread Tin Loaf Pan Light. I've used a vintage bread pan as the basis for the design. I've painted on a section that has a khaki tan crackled background with a snowman painted on. He is looking great with a scarf in a winter wonderland! Customize yours with your favorite choice of scarf color, tag saying and Lighting option. A great kitchen accent for the winter season! Lighting options are: 3" Electric Grubbied Candle Lamp with Silicone Bulb and On/Off switch OR a 4" Battery Operated Timer Candle. 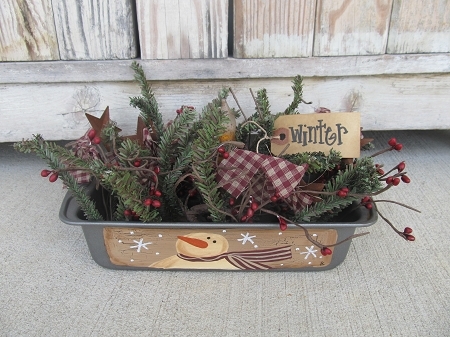 The pan has been filled with German pine, Burgundy pip berries, rusty tin stars and Burgundy checked homespun. Average size is around 9"x5" all pans vary slightly as I repurpose loaf pans. Featured in the November 2019 Country Sampler Magazine. Hand painted, designed and signed by Heidi.